Research has shown that acupuncture is effective for reducing hot flashes. The basic idea of acupuncture and Chinese Medicine is simple: Health is based on balance. Imbalances in the body lead to illness. We correct that imbalance with acupuncture and Chinese herbs, the body works to heal itself. Hot flashes are most often caused by an imbalance in the heating and cooling of the body. The body has the ability to warm itself, and it has the ability to cool itself. These qualities balance each other. In Chinese medicine, we described them as yin and yang properties, yang is warming and yin is cooling. Menopause can reduce the amount of cooling in the body. That relative lack of cooling causes a relative excess of warming, which results in hot flashes. In Chinese Medicine, this can be understood through the idea of Yin and Yang. Acupuncture works to replenish the cooling aspects of the body. Originally, the terms yin and yang referred to the two faces of a sun-bathed mountain. They called the sunlit face yang and the shady side yin. Philosophers observed that while these two sides are opposites, they are inextricably linked. When there is light, there is also a shadow. Philosophers thus used yin and yang to describe the dualistic and cyclic flow of the natural world: the day becomes night, the ocean tides ebb and flow, seasons change from hot to cold, and constellations of the night sky rotate throughout the year. Yin yang philosophy encompassed the ideas that opposites balance each other, create one another, flow into one another, and are both required for their mutual existence. This symbol, called the tai ji (supreme ultimate), represents the balance and mutual dependence of yin and yang. Yin is represented by black and yang by white. The diagram conveys the intertwined nature of yin and yang. Also, notice that at the core of yin lies yang, and at the core of yang is yin. Further developing the yin and yang concept, philosophers expanded the metaphor by assigning yin and yang general characteristics, which gave it the ability to describe objects and actions, in addition to natural phenomena. Objects associated with solid, dark, cool, and heavy characteristics are yin in nature and objects that are light, thin, hot, and translucent are yang in nature. Yin actions are slow and resistant to force, while yang are rapid and move without resistance. A central tenet of the philosophy states that everything has both yin and yang qualities. For example, a tree would be considered very yin in nature because it is solid and hard, but it also has yang features. The most yin feature is the tree’s roots, because they are deep in the ground and support the tree’s weight. The leaves, on the other hand, are very yang in nature, as they are thinner, grow more rapidly, and are less weighty. Actions can also be described in terms of yin and yang. The growth of the roots digging into the ground for nutrients would be a yin type growth, as it is slow and gradual for long term sustainability. Bringing water and nutrients up through the roots, the trunk, and finally to the leaves are the yang actions. These different functions are both needed for the tree’s survival. 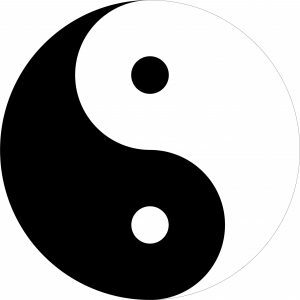 Yin and yang are the most basic concepts in Chinese medicine and are the key to health and wellness. Put simply, health is the proper balance of yin and yang. 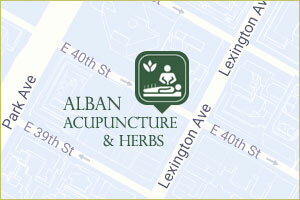 We use exercise, food, acupuncture, acupressure, and Chinese herbs to balance them. Yin is used to describe thick substances and stillness, and yang refers to more energetic actions and bodily substances. For example, blood is a yin type of substance and qi (usually translated as energy) is more yang. In treatment, the acupuncture techniques and herbs encourage the body to be more yang or yin in nature. Women during menopause tend to have too little yin, which has cooling properties. This in turn leads to a relative excess of yang causing hot flashes. To treat the hot flashes, we use acupuncture techniques and herbs, which add yin to create a balance.